Stunning Home with Panoramic Views of the Atlantic! Seascape is everything you could hope for in an Irish retreat... and more! Visit this little hideaway to enjoy a unique blend of charming accommodations and spectacular coastal views ~ all nestled into the heart of a quaint, traditional Irish village. Extensive renovations were completed on Seascape in early July 2007. Sleeping six comfortably, the house has three bedrooms, two modern bathrooms, oil central heating, a separate utility room, a designer kitchen with multi-fuel stove, television with an integrated DVD player, stereo system, wireless broadband internet throughout, a working fireplace and tasteful modern decorations - all surrounded by absolutely stunning sea and countryside panoramas. The living room ambiance will make it difficult to imagine ever leaving your home-away-from-home. A large vaulted ceiling sets the tone as you cross the threshold. Three generous windows provide natural lighting from all directions and draw your attention to the breathtaking scenery spreading out just beyond the deck. Overstuffed leather chairs beckon you to leave your cares at the door and sink into the tranquility of this unique haven. A working fireplace helps to deal with the fickle Irish weather. Stretching out beyond the living room is a generous deck which provides an even more dazzling vista. Just beyond the green, rolling hills and the dramatic, sheer cuffs is the ever changing horizon where ocean meets sky. No glimpse of this spectacular scene is ever the same! The yard is expansive and surrounded by high hedges offering seclusion and privacy for all without impeding the stunning vistas. Heed the local practice of yielding to the cows that may appear in the front meadow! The kitchen is fully equipped and state-of-the-art. It is comprised of newly painted wood cabinetry, classic black and white ceramic tile and fashionable counter tops. Integrated into this backdrop is a large fridge/freezer, a 4-ring gas stove top and all new chrome appliances. The windows above the sink draw your gaze out to the stunning Irish coastline ~ washing the dishes was never so enjoyable! The net result is a warm, welcoming setting in which to create and enjoy your culinary delights. The master bedroom has a comfy king size bed, fitted wardrobes, a designer style en suite bath with floor to ceiling tiling throughout and, you guessed it... a fantastic view! A sliding door exits to the side yard and allows for private enjoyment of the ocean view and the stars. The second bedroom has a queen size bed and fitted wardrobes. The third bedroom has two single beds and ample storage to accommodate two people. The guest bath shared by the second and third bedrooms boasts a corner Jacuzzi tub for relaxing after a day spent exploring the countryside. Parking is plentiful with space for up to 4 cars and sufficient outdoor lighting to aid your access at night. Our local caretaker, Maeve, lives just a short walk away and will appear at your doorstep upon arrival to welcome you. She is available to help with directions, appliance operating instructions and guidance for local points of interest. For a few extra Euro, Maeve will even stock the cottage with any and all creature comforts to make your stay that much more relaxing. Tragumna itself is a quaint village balanced on the edge of the Atlantic Ocean. The town has its own quiet harbor where Tragumna Bay drifts up onto Blue Flag Beach. Its claim-to-fame is a local pub named The Eagle which is known far and wide for its Irish hospitality, its love of traditional music, its family atmosphere (even playing host to the local dogs) and its ability to transport all who step through its doors back 100 years. To stock up on groceries you must drive 15 minutes into Skibbereen. Yet, a pint of beer awaits you a mere 10 minute stroll from Seascape at The Pub. A visit to this timeless institution is an experience not to be missed! Note that the walk (or stumble) back home to Seascape may take a bit longer. With its rugged peninsulas, clean beaches, towering mountains and some of Ireland’s most famous landmarks, West Cork is celebrated for its natural beauty. A favorite holiday destination for generations, West Cork offers a wide variety of escapes: from the gourmet delights of Kinsale to the rugged terrain of Dingle; from the lushness of Killarney National Park to the wild Atlantic views of Mizen Head. The region is historically and culturally vital to Ireland and still has a number of Gaelic regions. Visits to islands such as Sherkin, Garnish and Cape Clear are particular treats, while the Ring of Kerry, Old Head golf course and the towns of Killarney and Kenmare remain firm favorites year after year. Truly, a vacation of a lifetime is waiting for you at Seascape. Best vacation ever in Ireland! The house was well fitted out and the view was terrific. We loved our 2 weeks. Great welcome from Maeve Fabulous views. We stayed for 2 weeks and loved every day. The sea view was stunning the welcome from Maeve was warm and the area unbeatable. A beautiful setting in County Cork--the view out the living room window is postcard perfect. Maeve, the caretaker, is especially helpful. Lots to see and do in the area. We just returned from 2 weeks at Seascape. What a wonderful time. The weather was amazing (and not at all typical for Ireland) which made everything all the better. Even if we had the cold and wet, Seascape would have been lovely. The house is warm and dry, well maintained, and well stocked. We needed for nothing. The views were breathtaking. We had several clear nights leading up to a full moon and you could see all the way down to the cove. The day it did rain it was neat to watch the storms come up from the sea. Then we had beautiful rainbows! Maeve (the caretaker) was a saviour...collecting us the first night when we couldn't find our way in the dark. She also had done a little shopping for me. I am certain if anything had gone wrong (which it didn't), she would have been there in a flash to fix it herself or get it fixed. The owners were also really helpful in answering my questions. The directions are a little vague, so try to arrive in the daytime. Once you have been there they make perfect sense, but if you are not used to driving without street signs and numbers on the houses it can be a bit confusing past the pub. The most critical landmark for us was the big pine tree at the end of the drive (or lane). Tragumna is a lovely location, even in the off season. I can imagine how much fun it would be during the summer. 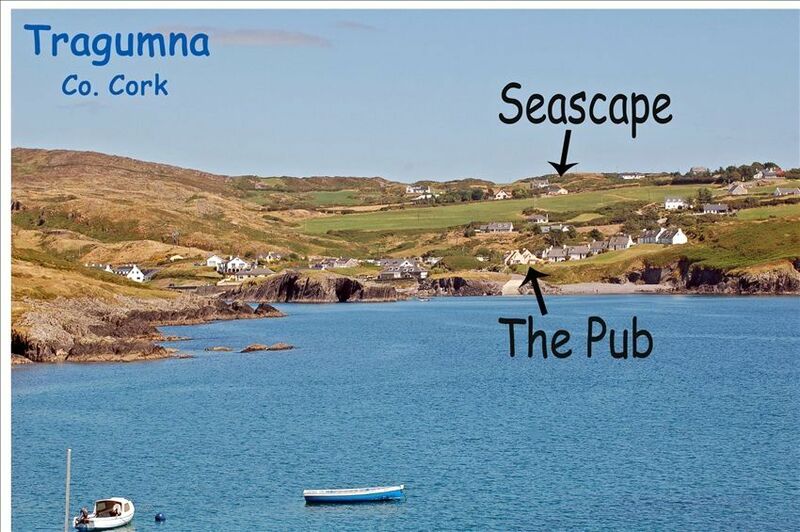 It was a perfect jumping off point for touring West Cork. The girls (2 and 4) liked shell collecting along the beach and walking up the road to see the cows, horses, donkeys and dogs. We headed to Schull to go fishing, and into Baltimore and then to Sherkin Island. Although it was a bit of a drive, we made a few trips to Cork and Blarney, even made it to Foda Island to the animal park. Skibereen had a lot to offer, including the Paragon (right next to Fields), which has a fabulous seafood chowder (yummm!). Had we known the Mizen Head lighthouse was closed we would still have made the drive, but just stopped at Barleycove. We never made it to the gardens between Skib and Trag, we just ran out of time. One thing about the property: the hot water, heat, and oven are all in one. It takes a little bit of getting used to, just know the water gets pretty hot, so don't just jump into the shower...test the water. But the whole thing is pretty efficient.